Electric Race News: Mission Motors re-entering electric motorcycle field, how will they stack up? Mission Motors re-entering electric motorcycle field, how will they stack up? Mission Motors appears to be coming back into the business of building high performance electric motorcycles. They of course started out in that business, but backed away from it when the company nearly died a few years ago. There was a change of CEO at the time, and a change of strategy. The new strategy was to focus on making EV drive train components to sell to OEM's. Along the way they developed software to help with designing electric vehicles, and EV dynamics, that tracked performance plotting it on a 3D map. The other day the company tweeted a link to a website containing solely the above image. 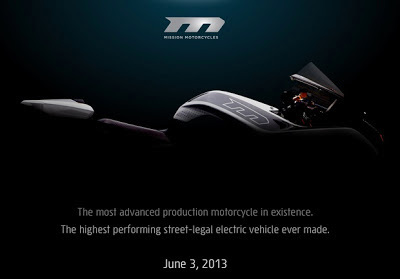 This is clearly teasing us with a new electric motorcycle that will be launched on June 3. All the while they we working on drive train components to sell to others, the engineers were using an electric motorcycle (the Mission R) as a test bed. The purpose they explained to me several times is that electric motorcycles have strong constraints on power and weight and size. Therefore, to successfully build a motorcycle with near-MotoGP performance (which they did) the components had to have a very high power to weight ratio. Their claims are interesting - however. To build the highest performing street legal electric vehicle ever made means beating out some strong contenders. Some of whom are in production already, and could plausibly have higher performance than whatever it is Mission will be launching in June. In my writeup elsewhere I focused on Lightning Motorcycles as the primary contender, but let's run down the list of possibilities, and why I settled on Lightning. Tesla Model S: Let's dispense with this one right away. Carefully reading the statement they make, "street legal electric vehicle" includes 4-wheelers, right? The Model S has a top speed of 130 miles/hr and 0-60 mph in 4.2 seconds. That's very impressive, but it'll be easy for Mission to beat that. The Mission R beat that in 2011, I believe. Rimac Concept One: This is probably not a production car so shouldn't be considered? The specifications page doesn't list a top speed, but says 0-60 mph in 2.8 seconds. Lightning Motorcycles: Lightning is in production right now, I haven't checked lately but the sales volume so far is probably still under 5 bikes. For some people that's enough to say it's a production electric motorcycle. The bike that's in production is the race bike. We saw it in race conditions last year, and for example at the Laguna Seca TTXGP/e-Power event last July they nearly beat the laptime record held by Mission Motors. At the 2011 Laguna Seca event Steve Rapp rode the Mission R, setting a fantastic lap speed record, while beating both Lightning and MotoCzysz pretty badly. For the 2012 event Lightning showed a strong improvement, but did not beat Rapps lap speed from 2011. Brammo Empulse RR: This bike is definitely not in production so shouldn't be considered in relation to the claims Mission is making about their upcoming bike. The RR instead is Brammo's prototype bike. With that bike Steve Atlas and Eric Bostrom were hitting 170 miles/hr at Daytona last fall, and they showed massive improvements over the 2012 season. I didn't get to see them at the Sonoma Raceway event last weekend but I hear they made a respectable showing within the pack of 600cc gas powered superbikes. 2013 MotoCzysz e1pc: Ditto what I just said about the Empulse RR. Not in production, and showing lots of improvements, including hitting the 100 miles/hr lap speed on the Isle of Man in 2012. As I see it - the way to validate Mission's claim is to get their bike into a race against these other bikes. Yes, in 2011 the Mission R with Steve Rapp riding beat Lightning and MotoCzysz. But both them and Brammo have moved a long long ways forward since then. Has Mission also moved forward? We won't know until the bikes can be put into a race against each other, eh?